Dead Cat Bounce - What Does It Mean? You have very likely heard the term "dead cat bounce" used to describe the markets as of late. 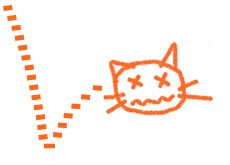 The "dead cat bounce" results when a stock (or market index) temporarily trades higher after suffering through a large decline. The idea is that "even a dead cat will bounce if thrown from a great height". If a stock trades from $20 to $2 over the course of a few days, then a quick move up to $3 would likely be described as a "dead cat bounce". The stock may enjoy a temporary "bounce" due to the covering of outstanding short orders and potential bargain-hunters swooping in to buy shares, but there might not be any real fundamental improvements in the underlying company. Example: A company, let's call it XYZ, is currently trading at $15 per share. After the bell one day, XYZ issues a press release stating that they are restating their earnings for the past two years, and are currently under investigation by the SEC. Not only that, but the CEO and CFO have suddenly quit the company. XYZ opens up the next day at $1.20 per share. The company, while under extreme duress and very likely to go out of business as a result of this news, trades up to $2.20 almost immediately after the opening bell. This is a "dead cat bounce". The bounce in the stock is due to short-sellers covering, and possibly existing shareholders in the company doubling-down on their positions. There is absolutely no fundamental reason for the stock to trade from $1.20 to $2.20, hence the term, "dead cat bounce".